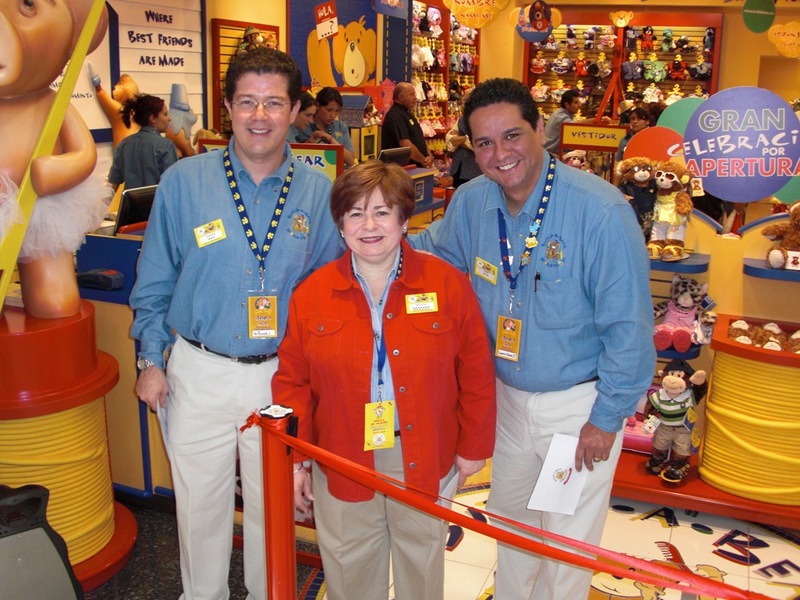 We received our first request to open stores in Mexico in 1998 and it has finally happened! 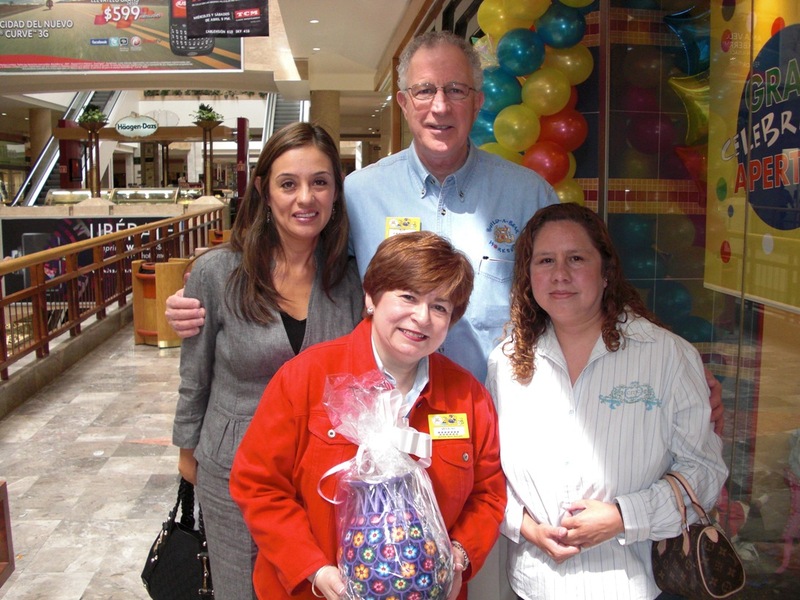 Our first store of many to come officially opened at Centro Sante Fe Mall in Mexico City on April 23. Our Mexican partners did an excellent job on all fronts and our Manager Aurora is going to be outstanding. It was worth waiting for this team. We arrived in Mexico City on Wednesday afternoon and already the excitement was in the air. The Friends and Family party for our associates was a hit. Our best advertisement for our company is almost always the people who work in our stores and their families. As a tradition we start every store off with a special night for our families and it was great to meet everyone especially the Pena Family who are the majority owners of the franchise for Mexico. The long awaited opening day was on Friday at 11 AM. The crowd started gathering at around 9 AM and people had come from all over Mexico to help us cut the ribbon. 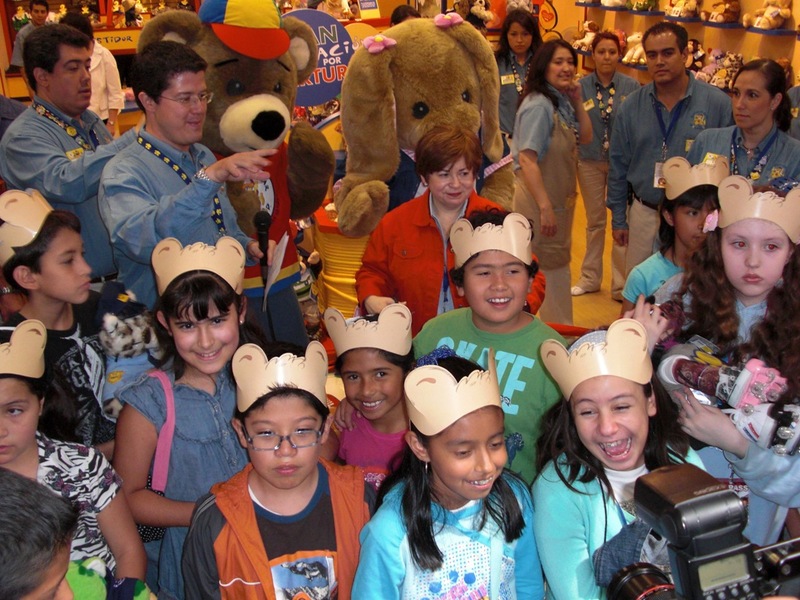 Many, many kids brought their well loved bears and told me stories of their visits to London, Disneyland, San Antonio, Houston, Orlando and so many other BABW cities. I also got to meet many of my facebook and twitter friends in person like Cynthia and Isabel. I was so glad to be back in Mexico. The people are so welcoming and warm and best of all they love shoes (high, high heels too) and teddy bears—my two favorite things. 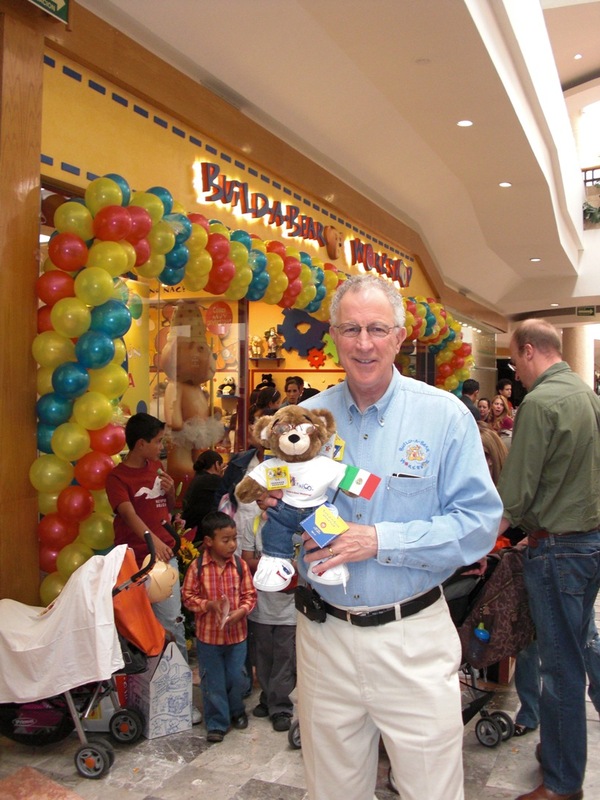 The first time I visited was in 2004 with one of our partners, Frank Vest, and we shopped this very same mall, Centro Sante Fe….a great mall then and even better now. By favorite photographer, and my husband, Bob was there to take pictures and be sure the store looked PAWFECT!! As usual Bob won the hearts of all and he is now known as Beto by all his Mexican friends. Bob and his bear Beto! Thanks to our great staff lead by our manager Aurora and to our franchise team. You did us proud! To all our Guests returning and new, muchas gracias. I will look forward to visiting again soon and often. 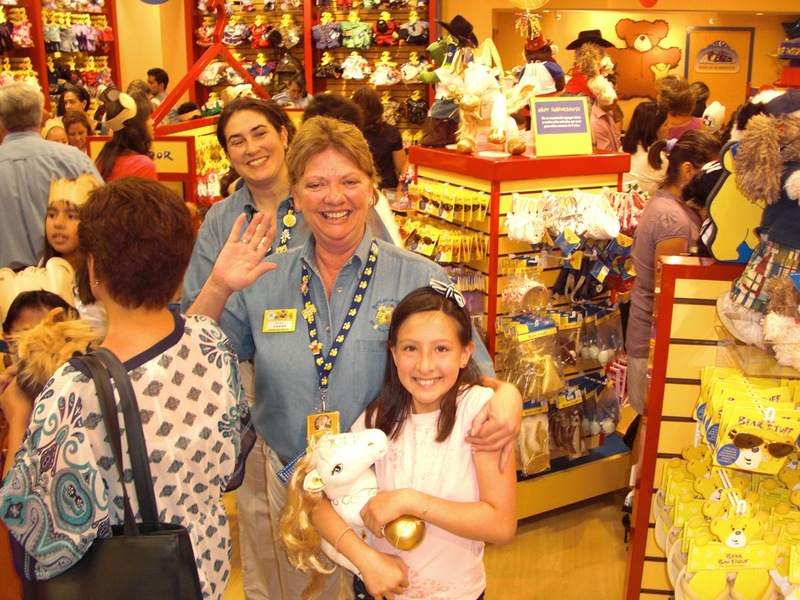 Since starting Build-A-Bear Workshop in 1997 I have met some amazing children and their families. Many inspire me to work harder for my community and harder for the less fortunate. Like Taylor Crabtree who has done so much for kids with cancer since she was 7 and now at college or Lucy Amrhein a young, kind caring woman in Maryland. Our Huggable Hero program was born of this desire to encourage and reward young people to give back to their communities. When a child gives, the return on investment is hugely magnified—maybe by 300 times. Each winner—10 winners per year x the past 6 years wins $2500 for their charity could mean –that could mean per $ invested, we have helped raise $45 million for causes supported by kids…. WOW!! In addition we also give each winner a $7500 scholarship to help pay for their college education. 1) My mom took me with her to her charitable activities—as much as it wasn’t always my favorite thing, I went and I learned a lot! To Hope School, to sit-ins at the Woolworth’s in DT Miami, to the Democratic Convention in Miami Beach…. So many wonderful memories of things we did together that mattered! 3) My parents raised me with a faith in God and to do the right thing. Again lots of Sunday school classes I didn’t love but they did help me gain a better ethical view of the world. Whether you pass the plate for donations at church or collect change in the Tsedekah box, charity is often an important part of faith based learning, at least it was for me. Pretty simple stuff really but what it gets down to is charity was part of our family culture. We were far from rich but we were billionaires in intellectual curiosity and world wide caring for others. Little did I know how our family culture—those 5 simple acts done over and over, would impact me in my adult life. This week is a big week for St. Louis and for my husband Bob and me. Casa de Salud, the health and wellness clinic he has masterminded for St. Louis in partnership with Saint Louis University will have its official grand opening this coming Friday. He has done an amazing job and bringing together various health organizations in this collaborative effort. I am so proud of him and his passion for this segment of our underserved population. Next Sunday I will introduce Talia Leman age 15, a 2007 Huggable Hero (she was almost 12) who will be in St. Louis to speak and inspire children as part of the Lee Institute founded by my recently deceased friend, Des Lee. Talia founded RandomKID and believes that ANYone can stand up and change the world—even a child. She not only raises money to do wonderful things herself but shares her money (over $10 million raised so far) with other children so they can do amazing things too. Truly the power of 1+1=10! Talia’s mom Dana is a wonderful supporter of Talia’s efforts and reminds me in so many ways of my mom and me and the difference we made together. Today while I was checking my tweets I saw a request for ideas from SVMoms to help families raise charitable children—I had to respond. My suggestion, do it together as a family. The family that volunteers together stays together! I am putting the outline together for my next book–“Becoming My Mother’s Daughter –Raising a Child With Heart” Thanks to all the parents and children who have inspired me to live a life of purpose and sharing. You are currently browsing the Maxine Clark's Blog blog archives for April, 2010.